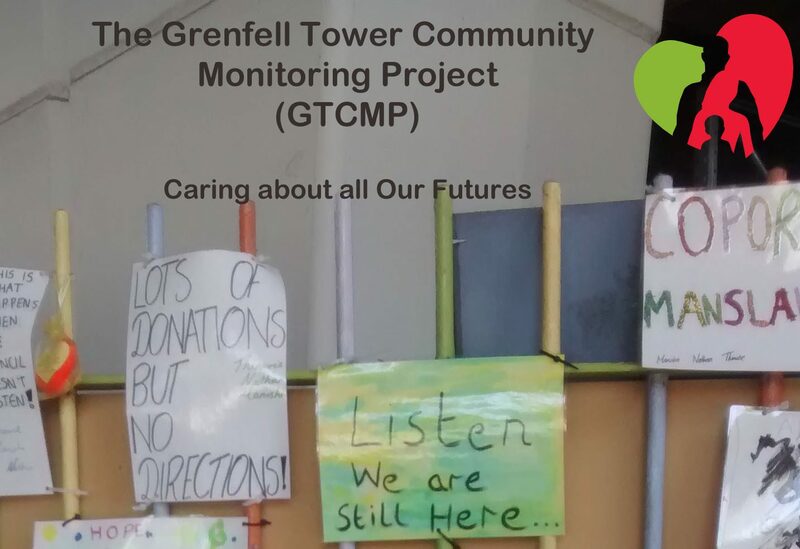 The Grenfell Tower Community Monitoring Project is developed by local residents for local residents and is linked directly to our neighbourhood. 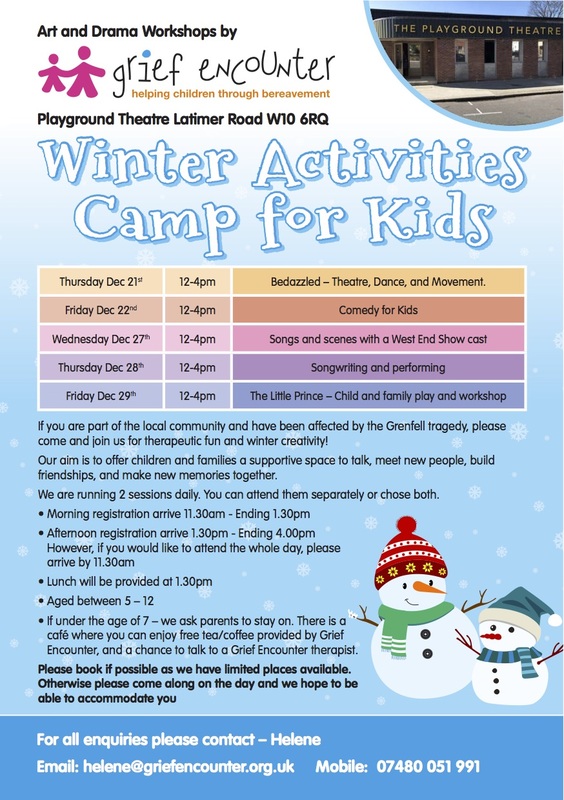 It’s developed from our perspective and includes the views of small or under-represented groups in our community. 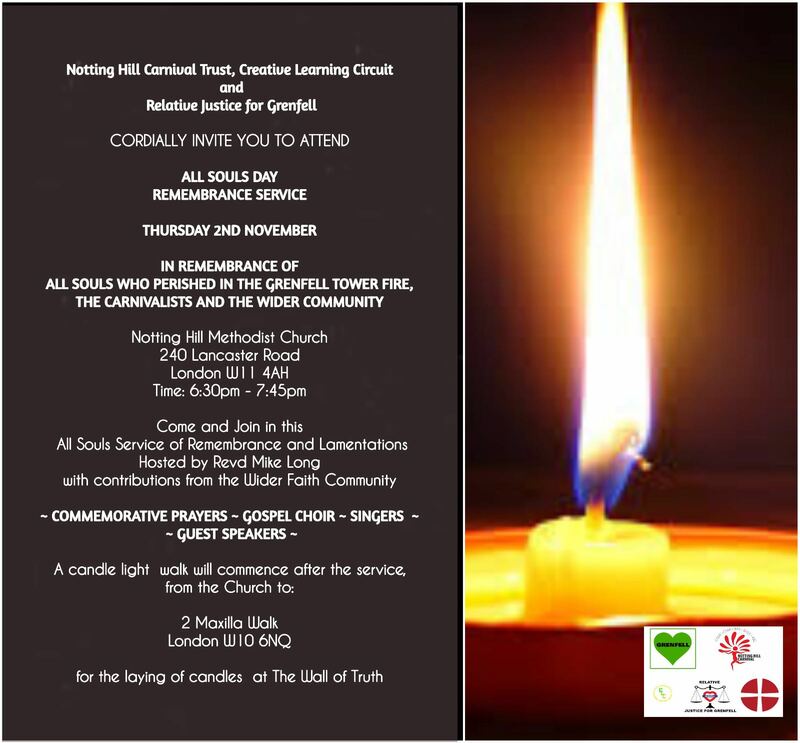 Essentially, the Grenfell Tower Community Project is designed to reflect the needs, aspirations, and expectations of the whole community, especially those of survivors, the bereaved, evacuees, and residents in the surrounding area affected by the fire. 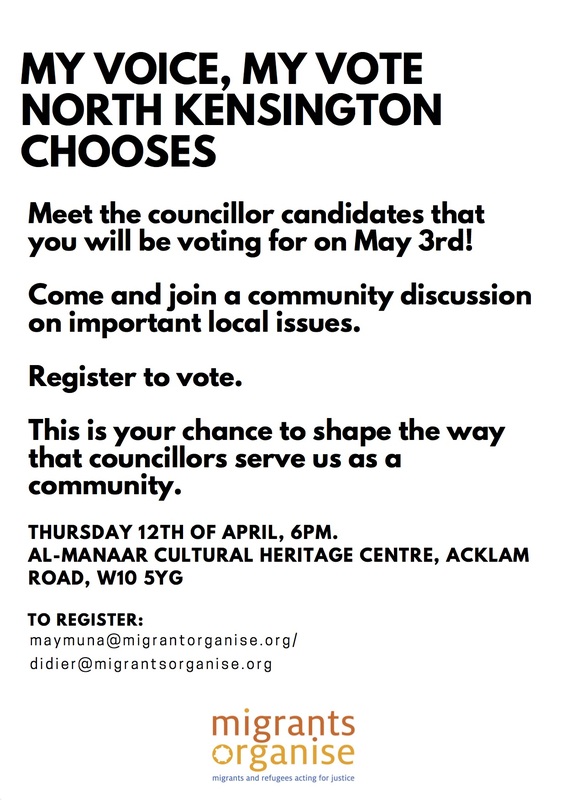 Through carrying out community-led focus groups or Chat Backs with those displaced by the fire and residents still living in the area; community Chat Back Leaders will be able to identify areas where services are failing. This information will be used to develop a suite of Community Owned Performance Indicators, which will measure how well the Council is meeting the needs of residents, how they can tailor services to suit the needs of residents affected by the fire, and allow for the community to hold the Council to account. Capable of being used as a thermostat to alter priorities on an ongoing basis. 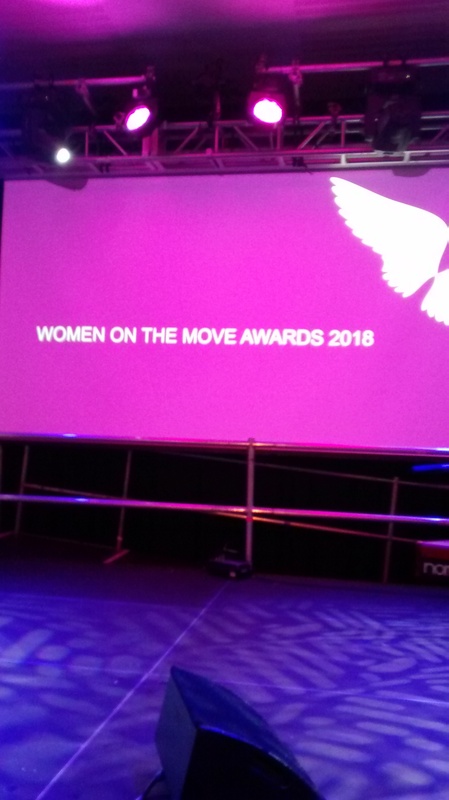 Amanda Beckles founder of the Grenfell Tower Community Monitoring Project speaks out against the Dame Hackitt’s refusal to ban flammable cladding in the UK. Amanda asks the Judge to consider why RBK&C did not take in to account the recommendations from the 2009 Lakanal House fire inquest when they started the programme of works on Grenfell Tower in 2016. Radio 4: “Grenfell Dust On Our Lips.” Hear what residents have to say about what it is like living near Grenfell Tower. Amanda Beckles shares her experience of living close to the Tower. Presented by Faisal from Grenfell Speaks! Please note: The programme starts at 00:33 of the recording. Please contact the GTCM Project for further details. This meeting will be discussing the Review of Governance for the Royal Borough of Kensington and Chelsea carried out by The Center of Public Scrutiny. Contact GTCM Project team for further information. 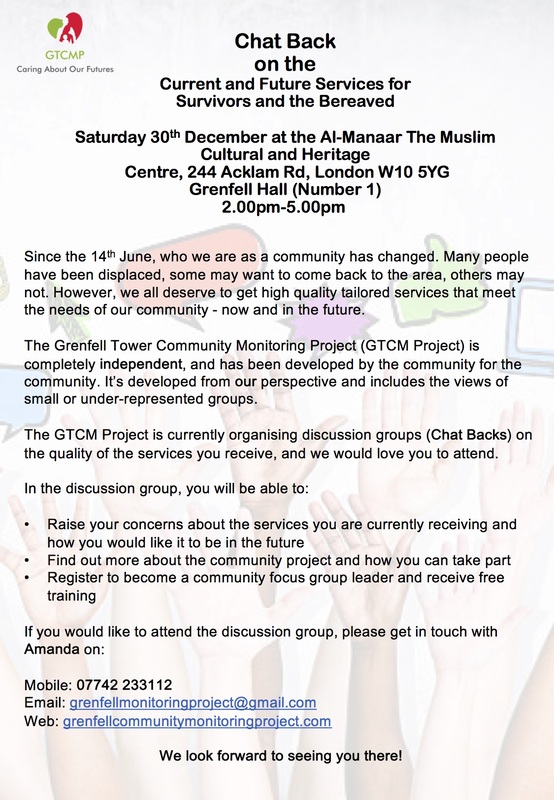 Chat Back Saturday 30th December 2.00pm-5.00pm at the Al-Manaar! 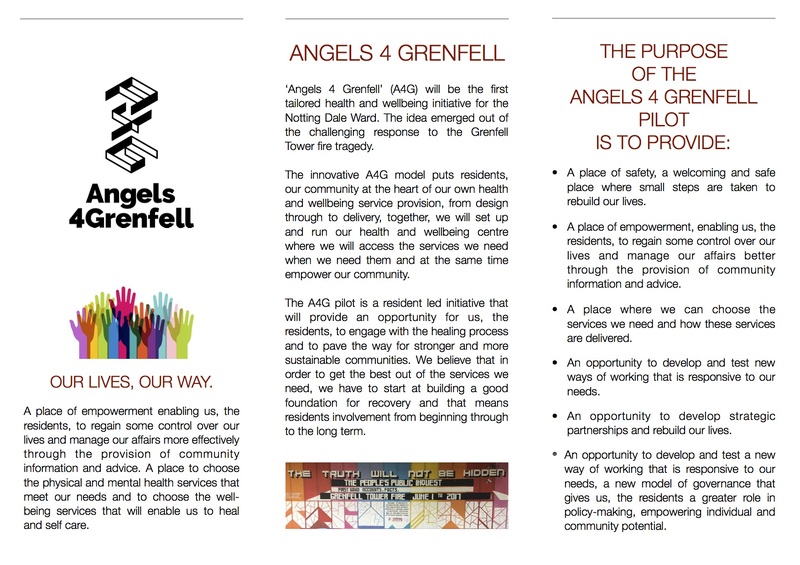 Angels 4 Grenfell: An exciting new community well-being centre for Notting Dale! You can read this website in your language by selecting from the “Language” drop-down menu.